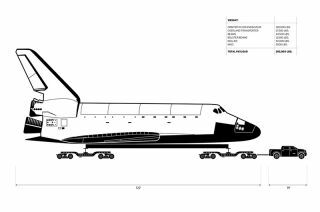 Schematic showing space shuttle Endeavour being towed by the Toyota Tundra truck for the California Science Center. Space shuttle Endeavour has been moved by rockets, its own engines and thrusters, tank-like transporters and industrial tows. Now retired and museum- bound, the NASA winged orbiter will add another, perhaps unexpected form of locomotion to its well-travelled history: a Toyota Tundra pickup truck. Toyota Motor Sales, USA, Inc. announced on Wednesday (Sept. 12) that its Tundra full-size pickup truck is slated to tow Endeavour during its delivery to the California Science Center (CSC), where both the space shuttle and truck are destined for display. Endeavour will travel the 12 miles (19 kilometers) from Los Angeles International Airport (LAX) to the science center on city streets, with the Tundra towing the shuttle during the last quarter mile (400 meters). Beginning Friday (Sept. 14), NASA will prepare Endeavour to fly atop its modified Boeing 747 Shuttle Carrier Aircraft (SCA) from the Kennedy Space Center in Florida to LAX. The three-day ferry flight is scheduled to arrive in L.A. on Sept. 20, weather permitting. NASA and the CSC will then spend a few weeks readying Endeavour for its Oct. 12-13 road trip. Once on the ground at LAX, Endeavour will be hoisted off its carrier aircraft and then lowered onto a modified NASA overland transporter originally used to move the shuttles from their Palmdale, Calif. assembly plant to the nearby air force base where they were mounted atop the SCA and flown to Florida to be launched. For the majority of Endeavour's parade through the streets of Inglewood and Los Angeles, its transport will be driven by four self-propelled, multi-axle vehicles. These modular movers are computer controlled; an operator walking with the shuttle will steer all four of the vehicles using a single joystick. Capable of moving sideways or spinning in place, these vehicles will enable precision maneuverability as the shuttle rolls past buildings, utility poles and trees. But when the Endeavour reaches Bill Robertson Lane and Exposition Park, a quarter of a mile (400 meters) from the science center, the Toyota truck will take over towing duty for the four modular machines. The shuttle Endeavour will be towed using a Tundra CrewMax half-ton pickup, identical to 2012 models currently found in Toyota dealerships, with no additions to increase towing capacity or provide more power. The Tundra CrewMax is equipped with Toyota's 5.7L V8 engine, producing a maximum tow capacity of 10,000 pounds. Toyota Motor Sales (TMS) has done extensive testing to lead up to its announcement and worked with The Sarens Group, a heavy lifting and engineered transport company, to develop a dolly specifically for hauling Endeavour. "There is no larger or more recognizable icon of the U.S. space program's success than the shuttle, and to have it towed by the Toyota Tundra is not only an incredible example of the capabilities of the truck, but an honor to be part of history," said Ed Laukes, Toyota Motor Sales' vice president of marketing communications, in a release. "The entire journey is something the world will be watching, and gives us a chance to prove that the 'overbuilt' Tundra is built to do any job — even tow the space shuttle." Los Angeles Mayor Antonio Villaraigosa (at left) joined others on May 17, 2012 at the California Science Center to name the new and future home of NASA’s space shuttle Endeavour for the late Samuel Oschin, an entrepreneur, explorer and philanthropist. Toyota's participation transporting the shuttle continues a partnership between TMS and the CSC to provide support and awareness of the space program and education of the public through exhibits and programs. Toyota currently has a Tundra truck on display at the CSC in an exhibit demonstrating the physics of leverage. The Tundra used to tow Endeavour will replace the Tundra now on exhibit and will be on display after the shuttle pavilion opens on Oct. 30. To further support the move, Toyota has developed a host of online resources and activities that provide behind the scenes videos, photos, activities for children, and details about the Tundra Endeavour project. The special website will debut on Monday (Sept. 17), the same day Endeavour is scheduled to depart Florida for Los Angeles. Visitors to the site can share content, sign up for email alerts and use Twitter to the spread word about the Toyota Tundra's role in Endeavour's delivery. For the first 10,000 "re-tweets" the site registers, Toyota will donate $50 to the California Science Center to support building the Samuel Oschin Air and Space Center, the permanent home for the space shuttle Endeavour. For more about the Tundra Endeavour project, see Toyota’s website. See shuttles.collectspace.com for continuing coverage of the delivery and display of NASA's retired space shuttles.